This book details the Rights of God in human governments. He has the RIGHT to be obeyed, even by the state. 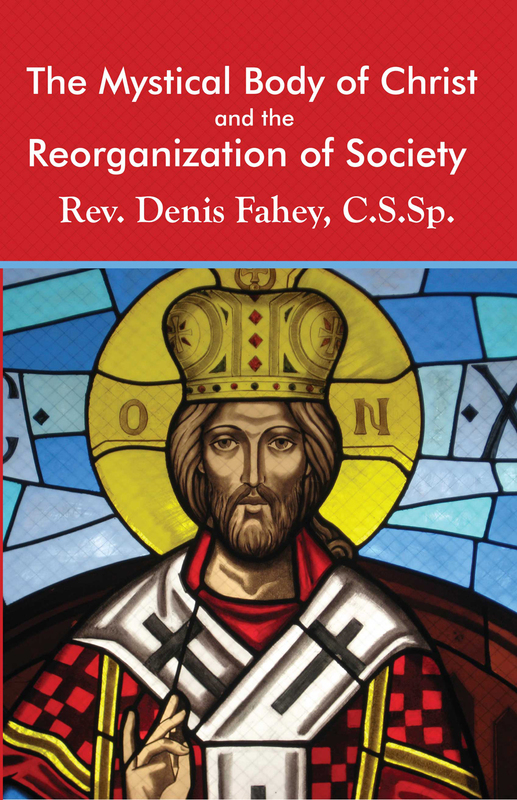 This book proposes the RE-organization of society according to God’s will for us on earth and within the context of the Mystical Body of Christ. Human governments will only be as good as they can be in this fallen world insofar as they conform to God’s Divine Plan for Order in establishing and running society. Here is that plan as laid out by God and his Church and explained by Fr. Fahey. Only when man puts God’s Rights first, will there be any hope of Human Rights being respected or upheld. After the fall of Adam, a world perfectly ordered to God’s divine will was corrupted and dis-order became the ‘natural’ state of mankind and the created universe. It was the role of the Messias to re-order this fallen world—to bring a new state of order to the world his Father had created. The means for establishing that order by which a fallen world may return to God is the Catholic church and the life of sanctifying grace. As Christians newly born into the life of grace—a supernatural state of being—we are all called to bring as much order to this world as is possible, all the while never forgetting that this world is in a fallen and corrupted state and that a ‘utopia’ is not possible here on earth. The Church of Christ is constantly opposed in this mission by all of the forces of ‘naturalism’ or dis-order, that is those forces opposed to the supernatural life of divine grace. It is the duty of all Christians of the Church Militant to battle against these forces. This calling of Christians to the battle for order was the motto of the pontificate of Pope Saint X. That motto was Instaurare Omnia in Christo, “to restore all things in Christ”, taken from Saint Paul’s letter to the Ephesians 1:10. The modern popes have frequently warned us of the dangers of ‘naturalism’, which denies the supernatural life of grace and militates against it, and they have called us to fight in our private and public lives against this pernicious error. No priest has heeded that call and risen to defend the supernatural life of grace as clearly and as vigorously as Father Denis Fahey. He truly understood, and explained why, there is no salvation outside the Catholic church, either for individual persons or for the life of society and of nations. Loreto Publications is committed to re-issuing all of the previously published works of Fr. Fahey and making them available to a much wider audience. The works of Fr. Fahey are critically important for Catholics to read, understand, and disseminate in our day when the forces of ‘organized naturalism’ or ‘anti-supernaturalism’ seem to be rampaging triumphantly through the Church and the world today. Arm yourselves for the battle! * The Social Rights of Our Divine Lord Jesus Christ the King (1932) Adapted from the French of Rev. A. Phillippe C.SS.R. by Fr. Denis Fahey C.S.Sr. 1. We have changed the spelling of many words to match modern American spelling rules. Some examples are: neighbor for neighbour, show for shew, labor for labour, realize for realise, mold for mould, program for programme, etc. 2. We have made use of current punctuation and capitalization rubrics. 3. We have made a few minor corrections of typographical errors in the original texts but have NOT altered the words of Fr. Fahey nor made any deletions. 4. We have made uniform the notations of scripture references in the currently accepted fashion. For example, we use Mt. 24: 6–9 instead of Matt. xxiv 6, 7, 8, 9.